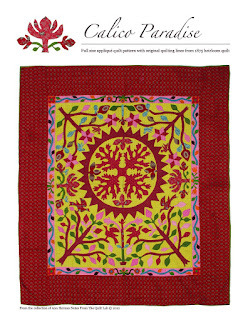 I love learning what makes other quilters “tick”. Where does that creative inspiration come from? I want to share just one example. 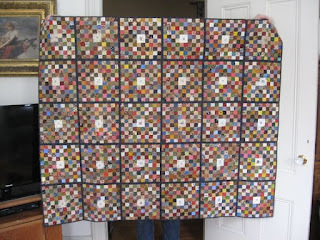 Audrey of Quilty Folk posted her amazing quilt “Sunburst” today (here). Isn’t it fantastic? I marvel at her choice of colors and her creativity. Here is what amazes me…This is the quilt that inspired her. 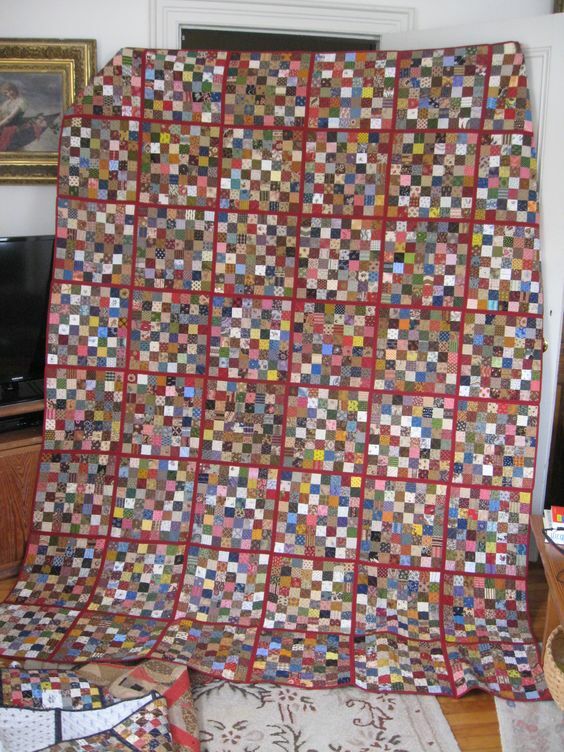 In 2006, I made a quilt (”Pennsylvania Palette” ) using this same quilt as inspiration. I had seen a photo on an auction site and I fell in love. 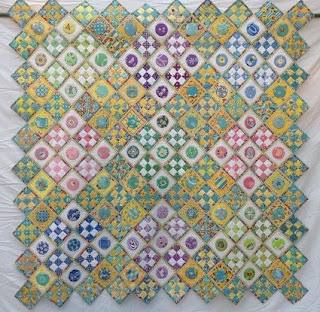 Years later I found out that Ann Hermes purchased the quilt and Dawn of Collector with a Needle made the pattern shown above called “Calico Paradise”. I ordered it immediately. I must say that Dawn does a fantastic job with her patterns and I highly recommend getting one for yourself. You can order it (here). 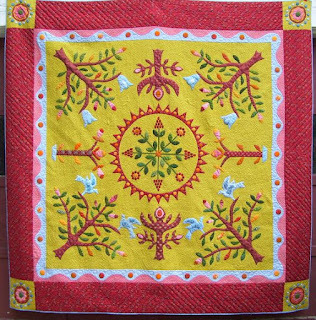 Even if you never plan to make it, the pattern is so lovely it is worth owning! 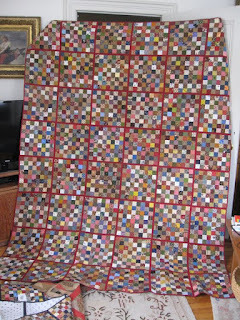 So you see how two people can come up with two such different quilts based on the same inspiration. What makes you tick? What gets your creative juices flowing? I found another post in the spirit of giving. Sarah at Confessions of a Fabric Addict, posted some wonderful charity (or what I prefer to call “community”) quilts (here). Here a two more of my little “sofa” quilts that will be going out soon. These two are quilted by my friend Ann Hussey. 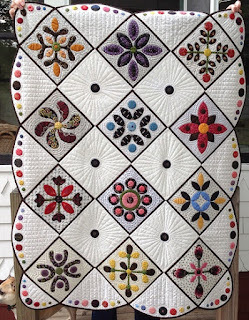 She never ceases to amaze me with her wonderful quilting. 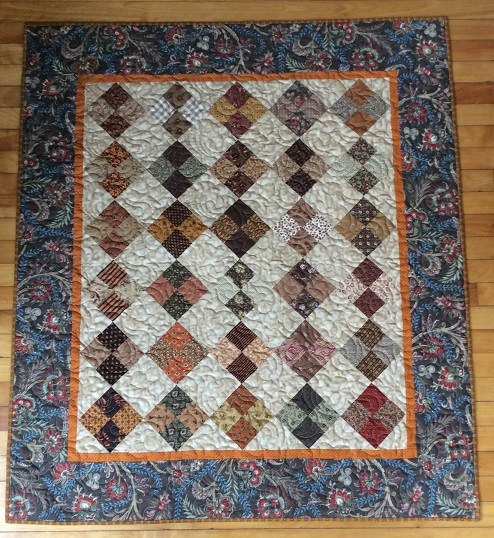 She quilted the 4-patch on my last post as well. 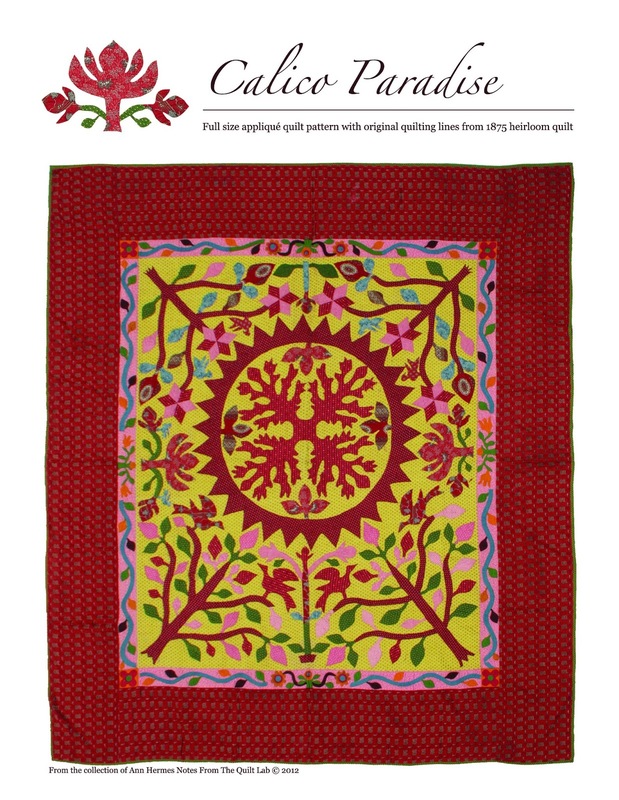 We have teamed up on quite a few “community” quilts. It is always easier and way more fun to have a partner! 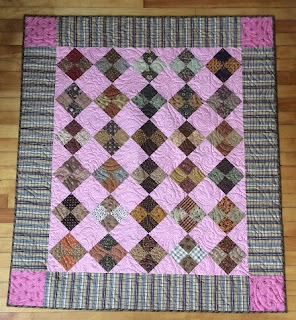 And a quick note about how far reaching and wonderous quilt “giving” can be: We rent the local Fire House for our evening quilt meetings and our all day Quilt-a-thons. We pay for the evening meetings once a month, and have been limited to 4 Quilt-a-thons a year because the expense of renting the hall for the entire day really adds up. At our Quilt-a-thon in January, the Fire Chief came in to speak with us. He said that one of the firemen’s children had been in the Barbara Bush hospital recently and had received a quilt. When they looked at the label, they realized it came from quilters who meet in their own firehouse! 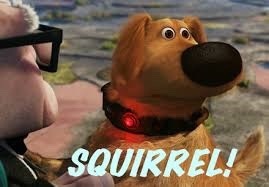 He said he was so overwhelmed at our generosity. He told us that we would no longer pay for any meetings at his Firehouse (including our all day Quilt-a-thons) as long as he was the Fire Chief. This is not “why” we give, but it does make us feel proud when people appreciate what we do and the spirit in which it is given. 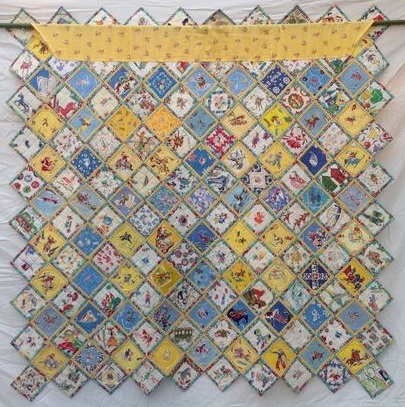 Please take a moment to read Lori’s post today (Humble Quilts). It is about some of the charitable work she has been doing lately. She is one of the most “giving” people I know (well, we haven’t actually met in person yet, but I know we will someday). 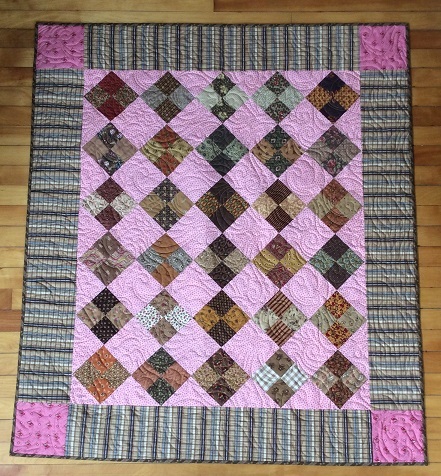 I think as quilters, we all give of our time and our money to those in need of support. Her post was particularly timely for me as I spent the weekend finishing up some “donation quilts”. This throw sized 4-patch is going to the National Quilt Museum in Paducah along with a cute little Puss in the Corner made from feedsacks that I forgot to photograph – argh! They have an auction every spring to help finance the museum. I started a few little ones for our state show this summer where proceeds from the sale will go to the Maine Coalition to End Domestic Violence and I am almost finished with the binding of a large quilt going to one of our Veteran’s homes. I’ll post photos of those when they are done. Honestly the hardest part of quilting for me is to remember to take photos as I go so I can share them on this blog! Here is my friend Charlotte. 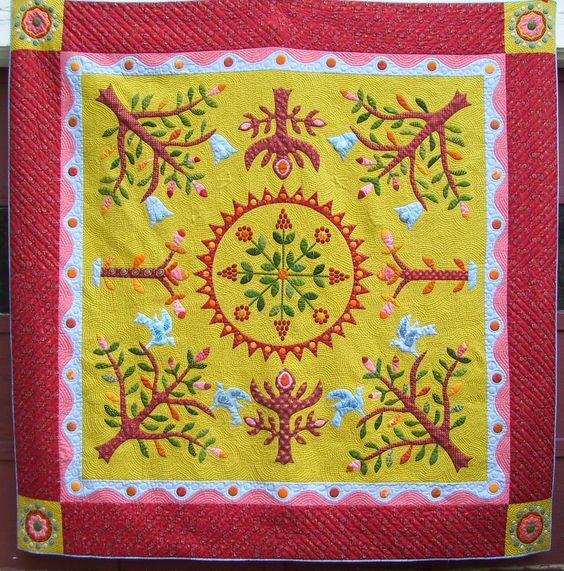 While on a very special trip to Germany with our friend Christina (and her husband, Rich), she did not skip a beat of the rhythm of her daily circle (Quilty 365) appliques. You go girl! Mine are coming along and will post my progress on the first of the month (no April Fooling!). There were a few questions about the original quilt so I am posting this close up. Don’t you love that stripe with the printed cording? 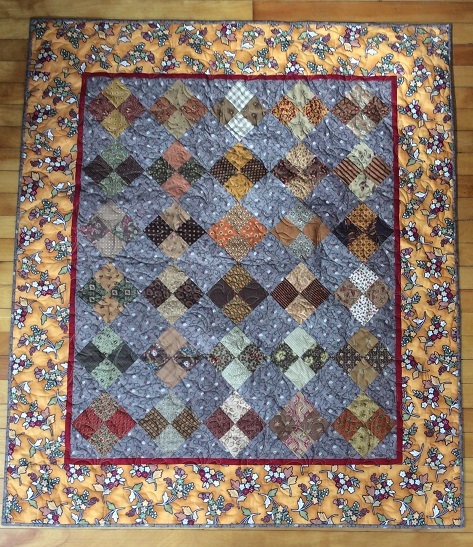 The quilting in the center is quilted with little clam shells which I plan to replicate. 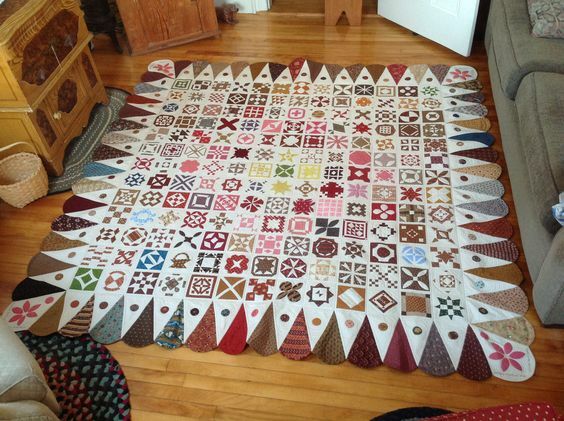 Not sure if I can match the border quilting due to size, but I will ponder it. I wanted to share my pressing method for smaller applique pieces. I don’t like to press the top of an appliqued piece if it has tiny points as the iron tends to scorch the fabric to a shiny glow if there is too much bulk in one area. So… I press from the wrong side onto a terrycloth washcloth or towel. I spritz with water first and then press on high to create a nice flat look. The “squish” of the terrycloth prevents the seam allowances from making an impression on the front of the piece (and it really is all about a good impression!). I hope to post the finished top SOON! Enjoy the day. 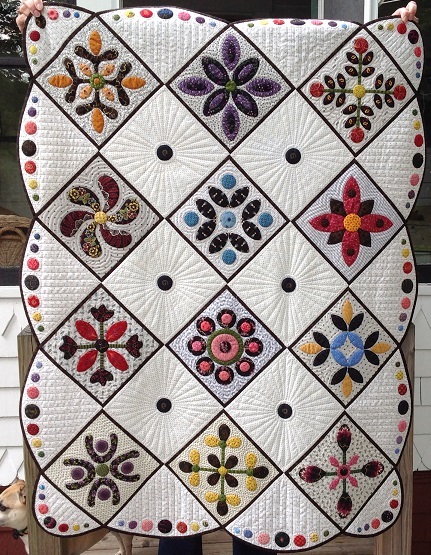 My friend Cyndi (Busy Thimble) and I are in charge of the antiques section of our statewide show “Maine Quilts 2016” this summer. This year’s exhibition is a bit different. 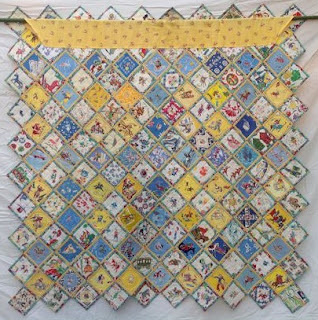 We invited quilters to choose a favorite antique quilt and reproduce it in a smaller version. I found this quilt last spring and thought it was so unique. I think I really chose it because I thought it would be an easy one to reproduce - ah - NO! First of all I found a fabric that I thought would work for the teal stripe, but it was off in color so I dyed it. Nope, that didn’t work so I bought more and dyed it another color. Closer, but not perfect. Then I had trouble finding the right fabric for the brown. Seriously, how hard could it be to find a reproduction brown? I finally chose this wonderful print designed by Judy Roche. Again, it isn’t perfect, but I like it and I like Judy, so it is now a win, win. but when it came to the leaf appliques I found that the pieces were so small that the strip looked odd. So I pieced the fabric in order to have a big enough piece to make an entire leaf in teal. I backbasted the vine for placement but did my usual semi random placement of the leaf and berry motifs because, well, it was easier! I realized after taking waaaaay too long to start this project, that maybe I should have chosen something I really loved. 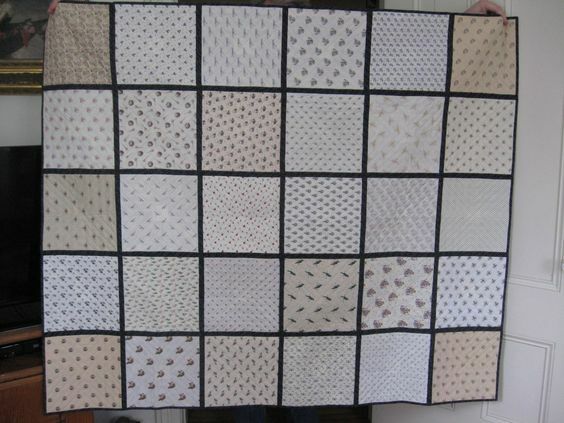 Not that I don’t like it, but I should have realized that a two color quilt would be far too bland for me. 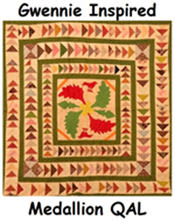 Thank goodness I have my cheddar background Shenandoah Valley Botanical Album Quilt blocks to work on too! 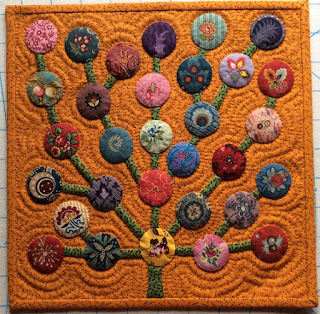 Cyndi is reproducing a potholder quilt in the collection of the Maine State Museum. She posted some of her blocks (here) . 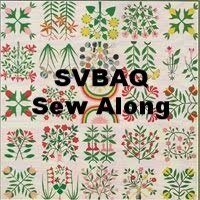 I loved making this SVBAQ block. It is my favorite so far even though I did make a few changes from the original. I just didn’t like that connecting branch at the top so, well you know. My block are also smaller than the original at 9" finished. I would not normally cut out the back of a circle so small because I don’t intend to quilt within the circle. However, because I did my trunk and branches first and then laid the circles on top of them, I wanted to cut out the back so the branch wouldn’t show through after pressing. They are not stuffed. 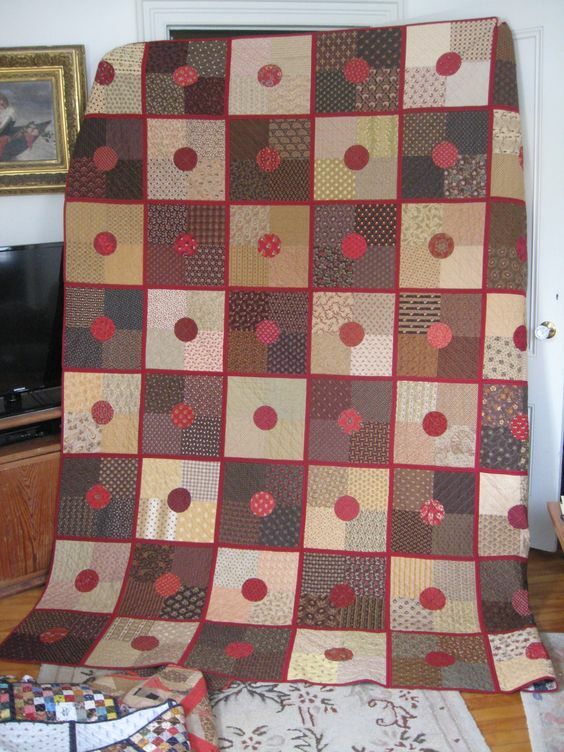 They just appear that way after quilting because I used a wool batting and even though I split it in half it still has quilt a loft. Enjoy all of these wonderful blocks by heading over to The Shenandoah Valley Botanical Album Quilt blog (here). But, what's on the other side? 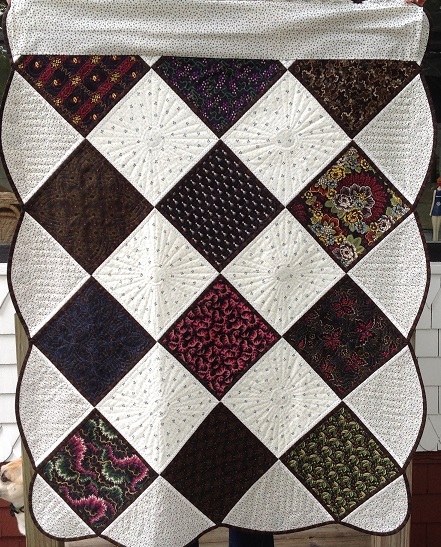 One of the great things about this method is that you can have a totally different quilt on the back. I used the focal fabric from the front on the back of each of the appliqued blocks and then just shirtings on the plain blocks. I have posted on my way doing the potholder method on previous posts. (Here) is one about how I do my bindings. The most important thing about this method is accuracy in the final measurement of the block. Of course you want nice, crisp corners on your binding s too, but the most important thing is that all your blocks are exactly the same size when finished or, well… they won’t fit together! Give it a try, it’s fun! My little quilt, Pan Blackened Applique was juried into the AQS Quilt Week in Paducah! I am so honored. I wish I could pack myself up with the quilt and go with it! 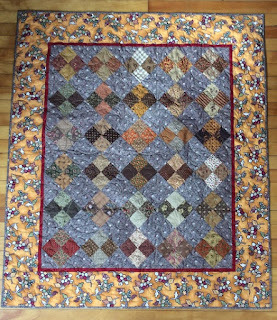 Yes, it is another of my potholder quilts. It was a challenge to get those little scallop blocks to fit perfectly together after binding them, but I like the end result. Sarah at Confessions of aFabric Addict is hosting a linky party to see how we all handle (or don’t handle as the case may be) our scraps. I must first admit that I am a hopeless fabric hoarder. My motto is, “You just never know when there may be a fabric shortage, so stash while you can”. I have mentioned before that 99% of my fabrics come from my favorite store, “The Busy Thimble”. Cyndi is about a 40 minute drive from my house and I try to get there at least once a month. I dream of the fabric I will buy all the way there and I dream about the fabric I will buy on my next trip all the way back. Cyndi is a constant source of inspiration. For my “un” organized scraps I have 3 different baskets according to size. Large, medium and scrids. Large and medium can be used in most projects where the scrappy look is wanted. 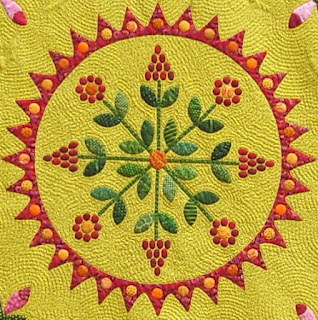 The scrids are generally used for appliqued blocks. I also donate large doses to my local quilt group and sometimes give them away through my blog. And sometimes I have “strings” for my friend Charlotte, who makes the most adorable fabric bowls from them. Clever girl! So, let’s hear your confessions. Do check out the link up at Sarah’s (here). 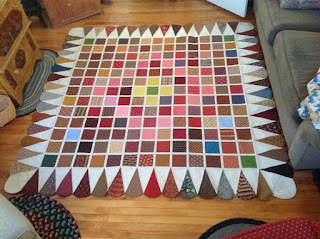 I love to see how quilters handle their scraps. Time to link up with Audrey’s Quilty 365. I don't have a design wall so I could only get a few rows in at a time. 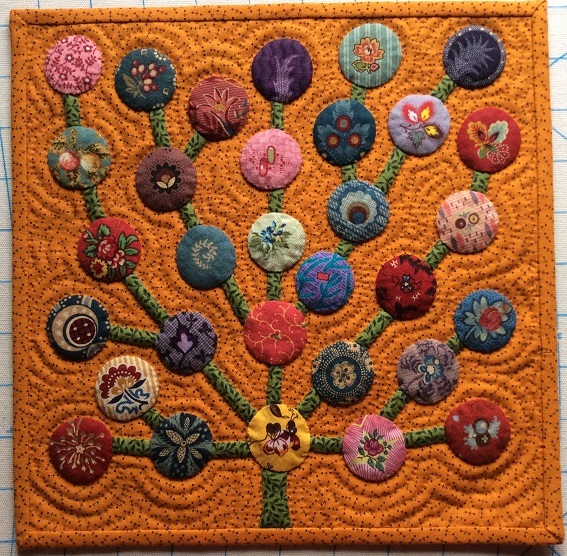 I began my journey on November 8 and with the exception of Thanksgiving Day, I have appliqued a circle a day since then. I have found this to be my total relaxation project. I am making mine out of vintage feedsack fabrics and so far I have not duplicated one fabric (I think). I usually prep a week’s worth on Sunday but if I fall behind, I just prep a few more. There will be 20 rows of 18 blocks each, plus a 4 12" border with corner blocks and I will add another circle in there somewhere to make it add up to 365. I realized yesterday, that I have a dilemma. 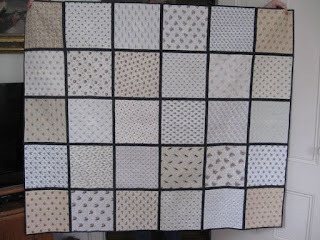 Because of leap year, do I stop on November 7 with my 365 blocks as planned or make one more and call it Quilty 366? I think I will cross that bridge in November! Because of the nature of feedsacks, the light fabrics tend to show through to the background if you don’t cut out the back. However…. Yup, once in a while you get a little overzealous and joila! a tiny slice appears. Easily fixable! Please check out Audrey’s link up. There are some fantastic stitchers and stories to go along with them. I love to see all the different approaches to this sew-a-long. Thanks again Audrey!